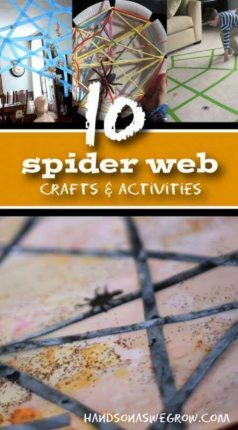 A Sticky Spider Web Activity for Kids - hands on : as we grow (affiliate link) and made a spider web to span the width of the door. 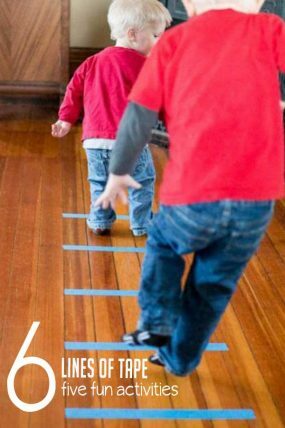 I absolutely love using painter’s tape in many activities, especially as a way to get the kids moving and learning. 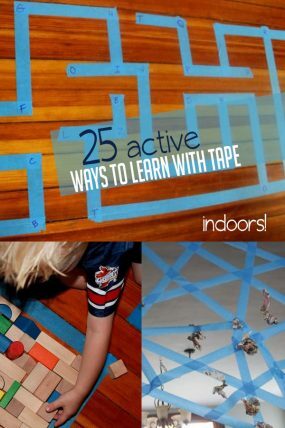 I have a list of 25 tape activities for kids to learn. I only made it on the top half of the doorway, because I knew if I went to the floor, the boys would be trying to run through it and tear it down. While I taped up the sticky spider web, I had Henry rummage through our recycling bin for some newspaper. He’s a perfect little scavenger! I asked him to separate the newspapers and scrunch each one into a ball like we had done for the newspaper throwing game. Then the boys had a blast throwing the newspaper balls into the spider web to see if it would catch them (just like a real one would catch a fly!). George had a tough time throwing the newspaper high enough to get it stuck in the spider web, but he could just barely reach the bottom part of the web, so he stuck the newspaper balls to it by hand. George just got The Very Busy Spider book (affiliate link) by Eric Carle for his 2nd birthday. It’s been a great extension to this activity (or maybe the other way around) to talk about how the spider web caught the fly. If you’re a tape fan like me, click the image below, you’ll love our spy game scavenger hunt too! So…what would you think about a father who plays with this…like…all the time? Perfectly normal, right? Right? Asking for a friend. Trying to use colors that go with my theme, would masking tape work okay for the spider web game? giant spiders web in the house must have been awesome or your boys. I’ve pinned this for a rainy day! I cut up cotton balls and left a bowl of them labeled “Spider Food.” We added some kid-made spiders. Then the kids could feed them whenever they wanted. That is the best idea! My preschool class will love this- we are learning about creepy crawlies. Thank you!! Love this idea!! 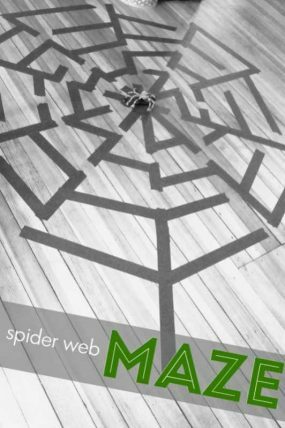 Can’t wait to do it as part of our spider week this week! What kind of games do you have or recommend for a 2 year old I have a grandson who is an only child we need ideas! Thank you! This saved our sanity on the last few hours of an overnight sleepover with our 2 kids and our friends’ 2! It was a little tricky to get them to stick at times, but a lot of fun. Awesome to hear! Glad you guys had lots of fun! Thanks for sharing it! It would be so much fun for a Spiderman party! love this idea, will be keeping a note of this. I found this game on Pinterest a few weeks ago. We could not get newspaper to stick at all though. The kids were really upset. I ended up making balls of painters tape (sticky side out) and that actually stuck. Girls loved this game! Oh that’s a bummer! I wonder if its a difference in the type of Painter’s tape? Ours stuck pretty good! What a great idea! I am going to use this for one of our kids games this summer at our churchs annual car show. Thanks! How doesn’t it work Shoobie? We did it! Newspaper or magazine pages do not stick from throwing (only by manually placing); I am guessing that was her issue. We tried balls of painters tape but it stuck to our hands too well. Cotton balls worked the best, as suggested by another commenter here. OMGeee! My boys would love this! What a great, simple idea. I’m going to try this over Christmas break when they’re bored :). 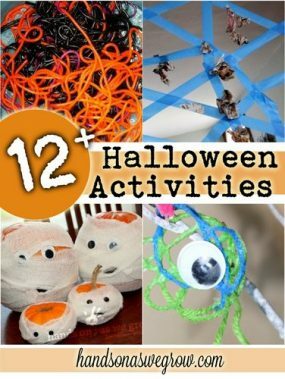 I did this concept with (2) 2.5 year olds, using duct tape and tissue paper balls (what we had available). It’s a great idea, but we had a problem that the “bugs” wouldn’t stick. We then tried plastic balls (from a ball pit), they didn’t stick either. Finally we had luck throwing cotton balls. Using super sticky duct tape, I anticipated the opposite. Turned out to be a science experiment too! My girls would love this! 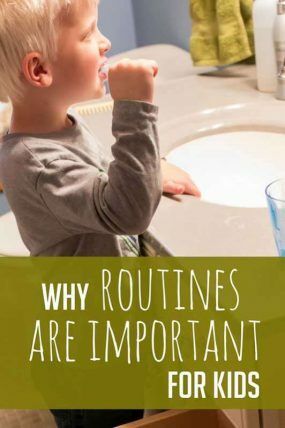 Any excuse to throw stuff! 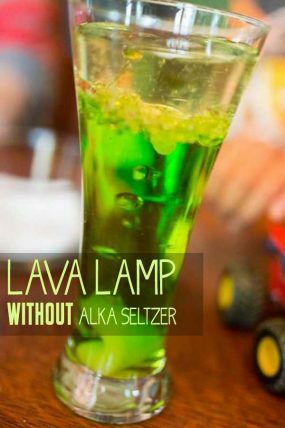 looks like great fun must try it! How fun! 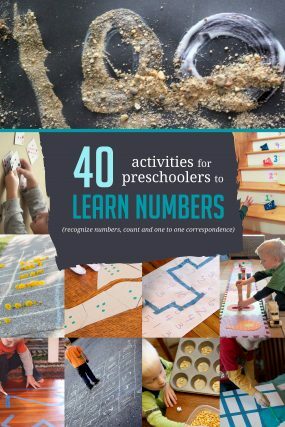 We love the Busy Spider book — and my son is so into throwing lately! Just had to +1 this! Brilliant idea. So quick and easy to set up too. I love things like this! 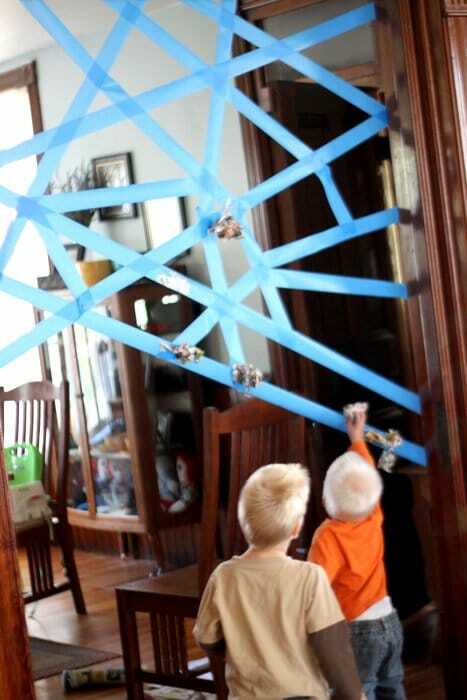 This looks like great fun, the novelty of having a giant spiders web in the house must have been awesome or your boys. I’ve pinned this for a rainy day! LOVE! This is cute and looks fun. I know I got some painters’ tape around here somewhere!